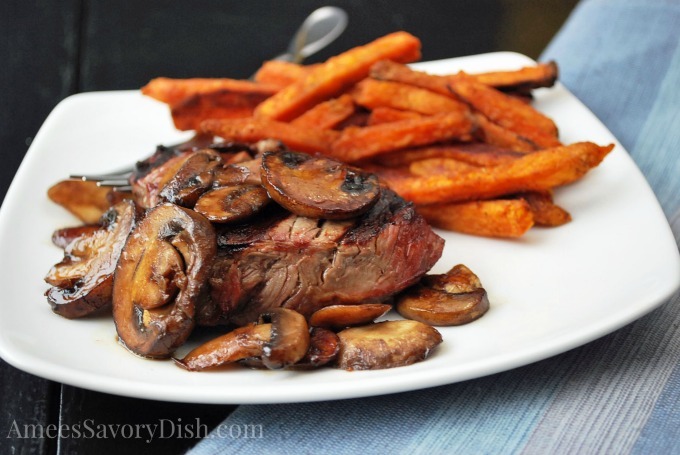 Weeknights can be so busy, that’s why I love nutritious meals, like this Grilled Top Sirloin with Balsamic Glazed Mushrooms, that can be prepared in less than 30 minutes. Top sirloin is one of my go-to meat choices for family meals, because it’s tender, delicious and an affordable cut of lean beef. *Budget-savy mom tip: you can save quite a bit of money buying your meat in larger cuts from the butcher and cutting it into smaller steaks. Potatoes are always the perfect accompaniment to steak and my family loves the all-natural Sweet Potato Fries with Sea Salt from Alexia Foods. They are simple to prepare, made with premium, real ingredients and cook up in less than 25 minutes. By the time the grill is warmed and the steaks are cooked, the baked fries will be ready to serve…easy breezy! Pair this meal with a mixed green salad and you have a well-rounded meal the whole family will enjoy. 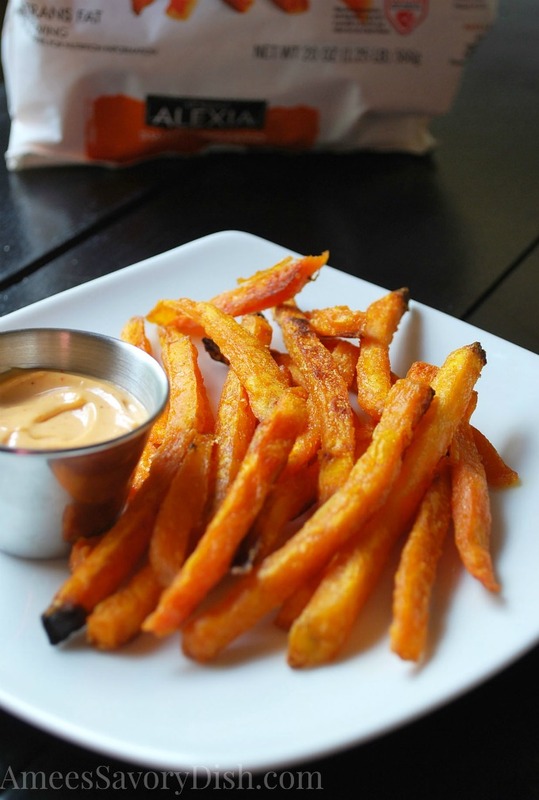 If you want to kick things up a notch, try this spicy Sriracha mayo dip. It’s so amazing with sweet potato fries! Stir ingredients together and serve with fries. 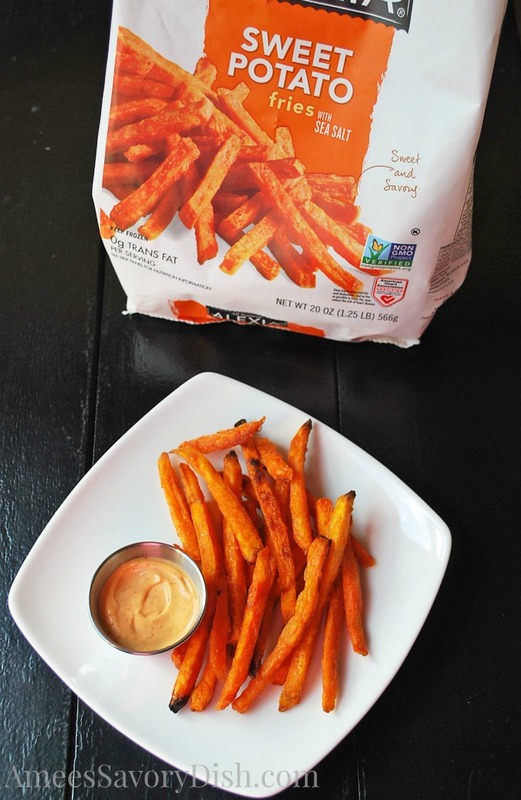 Don’t forget to grab a bag of Alexia Foods Sweet Potato fries with Sea Salt on your next shopping trip! They are usually located in the all-natural freezer section of your local grocery store. They have so many delicious varieties to choose from, including: Alexia Smart Classics Roasted Crinkle Cut Fries with Sea Salt, Crispy Onion Rings with Panko Breading and Sea Salt, Organic Yukon Select Fries, French Herb Green Beans, Parmesan Peas, Italian Herb Corn with Sundried Tomatoes, Southern Sweet Potato Blend and more! Alexia Foods produces quality products that I am proud to serve my family. Check out more family-friendly recipes at the Alexia Foods website. They have a lot of quick and easy dinner ideas to inspire your next meal. Also, be sure and sign up here for the Alexia Club 350 for exclusive deals! YUM! Perfect for a busy night!